One in three people plan to buy a gift card as a Christmas present this year, according to new Which? research. Less impersonal than money in a card, gift cards offer the recipient the choice to buy, or put money towards, something they would really like from a retailer they love and trust. So, it’s no surprise that when asked if they were planning to buy a gift card for someone as a Christmas present, 29% of Which? members we spoke to said they would definitely or probably do so. As the Christmas shopping rush looms, we explain the pros and cons of buying gift cards in a year that has seen Toys ‘R’ Us, House of Fraser, Maplin and Poundworld go bust. We also explain what happens if you run out of time, lose a gift card, or the retailer who issued your gift card goes into administration. Who is most likely to receive a gift card? 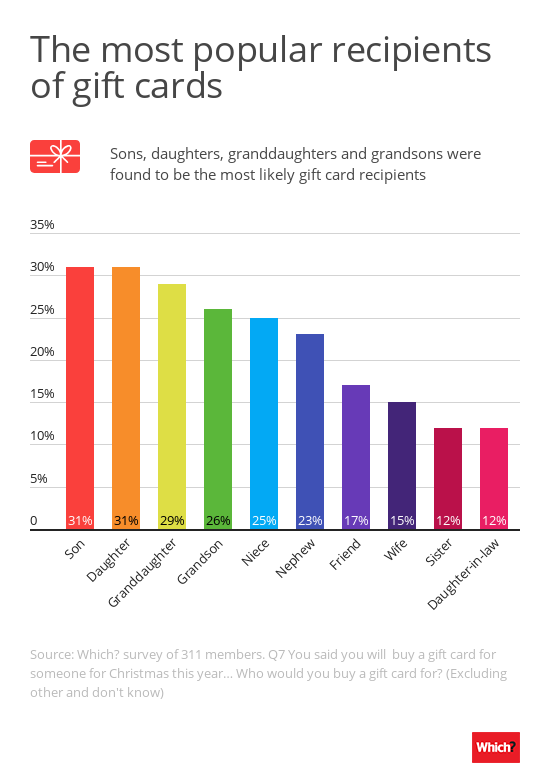 Sons, daughters, granddaughters and grandsons were found to be the most likely gift card recipients. And, while our research found gift cards to be a popular choice for early birds and last-minute Christmas shoppers alike, gift cards are a great option for those who are running out of time. 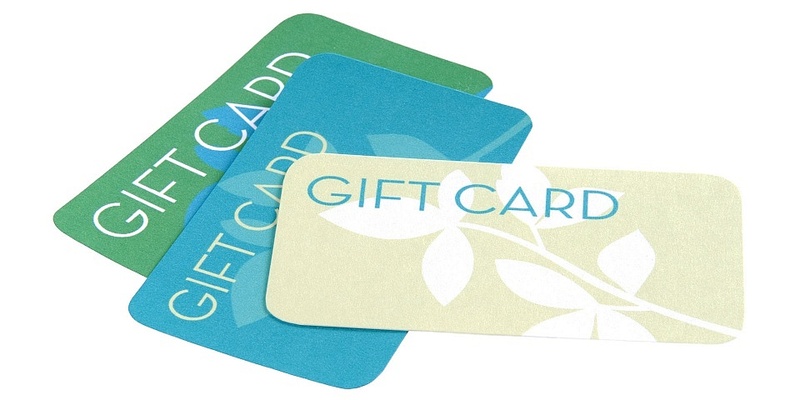 There are pros and cons to gift cards, which it pays to know about. The most common frustration of people who have received a gift card is that it runs out before they get time to use it. Gift vouchers and cards will expire eventually. However, the amount of time you have to use the gift card or voucher can vary – from specific dates and seasonal months to anywhere from three to 12 months, for example. Expiry dates are permitted as long as the person buying the voucher was made aware of this at the time of purchase. Adele Dyer said: ‘I bought my niece a gift card a couple of years ago as a Christmas present – she wanted perfume but didn’t know which one, so I thought I could give her a gift card to go and choose what she wanted. She eventually bought perfume elsewhere so I had the gift card back from her and went to use it myself. If you’re thinking of buying a gift card for someone this Christmas, check the expiry date to make sure the recipient of your gift voucher still has enough time to spend it. Make them aware of the expiry date and any other important terms and conditions when you gift it to them. If you are the recipient of a gift voucher this Christmas, look at the expiry date as soon as you receive it, so you know how much time you have to use it. If you’ve lost your gift voucher, you may be able to get one reissued by email for free, or a physical replacement sent to you for a small fee. But gift cards are like cash. So if you lose it you might be out of luck. 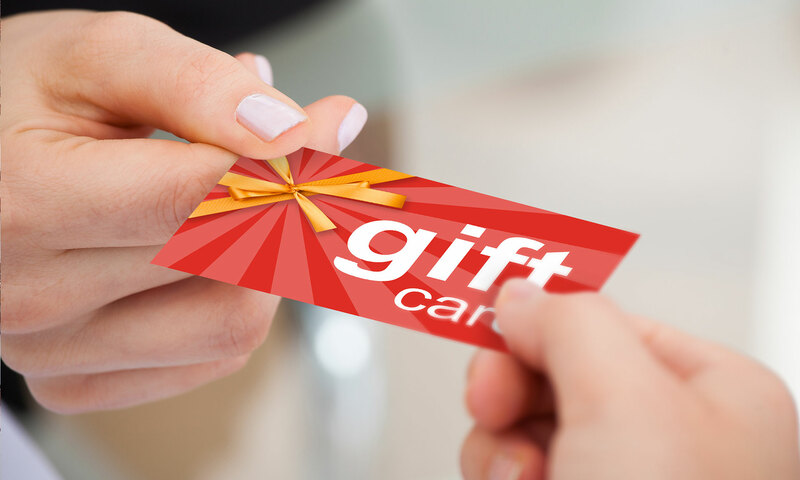 Your chances of getting a new gift card issued will depend on the terms and conditions of the gift voucher and the retailer’s policy. If you got the gift voucher or card as a present, you’ll need to ask the person who purchased it for you to help. Gift cards became a hot topic for House of Fraser customers earlier this year after the major department store went bust and was swiftly bought out of administration by Sports Direct owner Mike Ashley. When a retailer goes into administration, any gift cards and vouchers you have to spend with a bust company are usually anywhere from tough to impossible to redeem. This is because your gift card purchase remains the liability of the old administration that has gone bust. 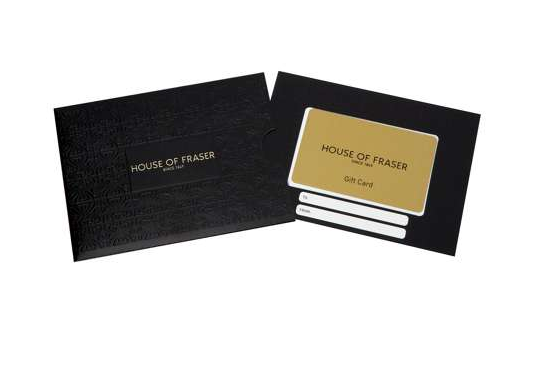 House of Fraser was doing its customers a good deed when it instructed them to send House of Fraser gift cards to its Baker Street office to be re-issued. While it has taken a long time to get these reissued, in recent months people have started to receive gift card replacements. It is a voluntary goodwill gesture for retailers who have gone bust to honour gift cards, and it is not common for them to offer this. 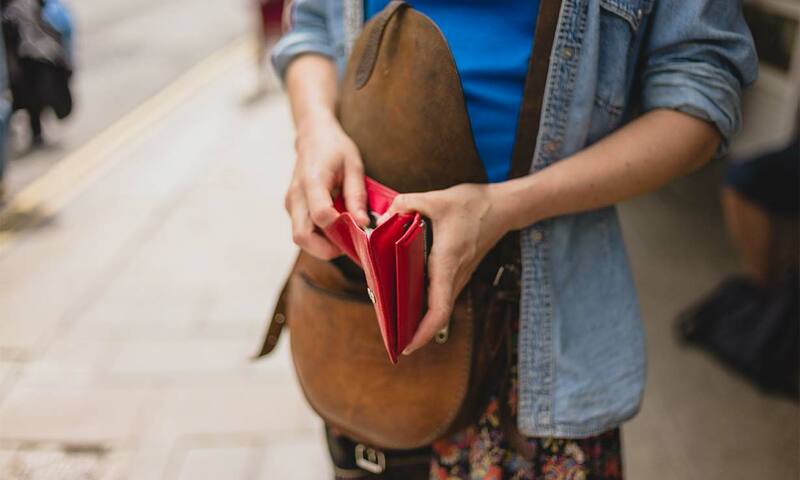 The past 25 years have seen the UK high street undergo dramatic changes. Household names such as Woolworths and BHS have disappeared, the rise of online marketplaces such as eBay, Amazon and Etsy means finding a bargain is not only confined to Saturday markets anymore, and omni-channel shopping has become the new norm. The outlook for the British high street has seemed bleak at times, so gift card purchases could be seen as risky. But does it have to be this way? Maybe not – we’ve examined what the UK high street could look like in the future. In October 2018 we asked 1,263 Which? members whether they were planning to buy a gift card as a present for anyone this Christmas. 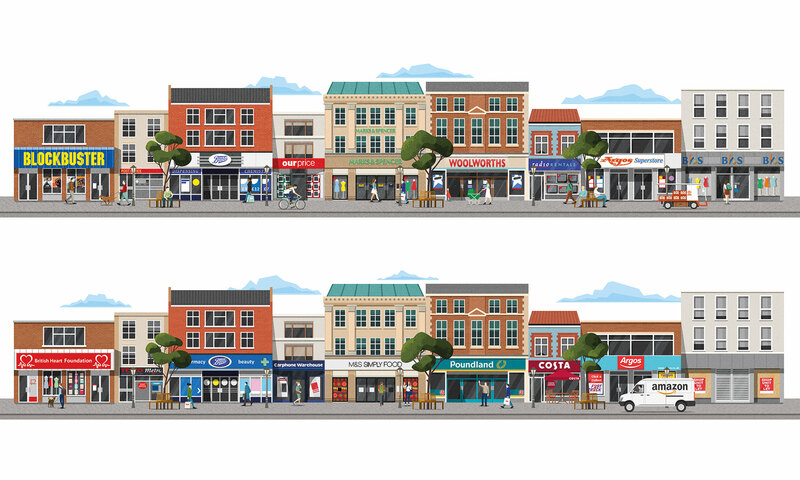 What does the future of the UK high street look like?